My mom still watches those same shows and if I seen every episode twice she had to see them each at least 20times! That is why I am super excited about her Christmas gift this year. You see my mom is a bit obsessed if you have not caught on. Sadly she has to wait for reruns to come on tv and watch them from her DVD collections she doesn't have them all. When I was told to pick one thing from the site for review I had a pretty tough time choosing. I wanted to get myself something from the Downton Abbey collection. It took a lot for me not to be selfish and get something for my mom instead. 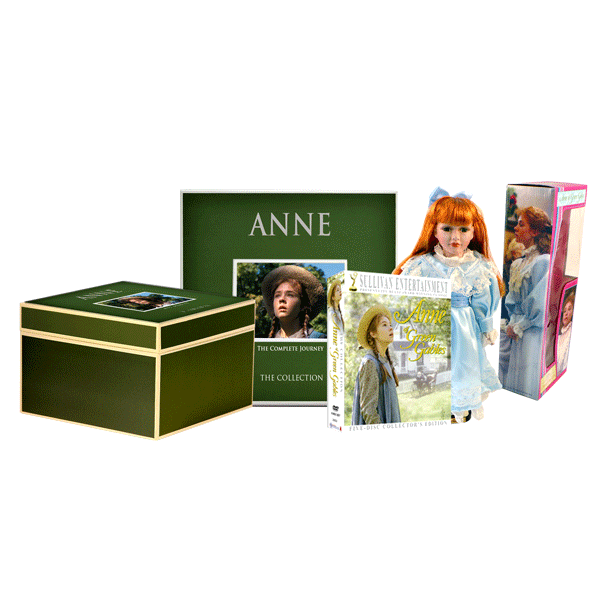 This set includes a lovely 12" Anne of Green Gables porcelain Doll, wearing the iconic Puffed Sleeved Dress and the three part 20th Anniversary Anne of Green Gables DVD set.Filmed amidst the spectacular scenery of Prince Edward Island, these Emmy Award-winning productions span two decades, from Anne's struggles as an orphan in a small maritime community, to her triumphs as a young teacher, to her search for her husband on the battlefields of Europe. A delicate, moving epic full of wit, style and emotional power. Now not only will my mom own some of the DVD's she will have her very own Anne of Green Gables Doll! The Doll is beautiful and stunning in its details! I cannot wait to see my mom's face Christmas morning when she opens this package.